· ☀ BACK HOME BUTTON: With the built-in placement system, the drone can automatically locate the remote control. Just press the return home button and your drone will fly to you. · ☀ TURN UP TO 360 DEGRES: WSAD flights are so simple that they can get bored. Therefore, this drone is prepared to be able to give turns up to 360º, something that does not leave indifferent. 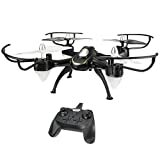 The drone is designed for you to perform excellent flips and turns at the touch of a button. · ☀ HEADLESS MODE: The drone will change the direction of flight by switching it on the controller, which is especially useful for beginners as it gives greater confidence when they are in flight. · ☀ NOTE: If you received the products whose tape has been demolished, do not worry, this is because we ship a product before doing the frequency test, in order to ensure normal customer use. If you are not satisfied with this, you can contact us to request a refund and a return. · Description: Brand name: EACHINE Product name ： Eachine E33C RC Quadcopter Frequency: 2.4G Channel: 6ch gro: 6 axes Battery: 3.7V 450mAh 25c (inlcuida) Charging time: 60-70mins Flight time: 8-10mins R/c distance: 80-100m Camera: 2MP Product size: 25 * 25 * 7cm (without protective cover) 26 * 11cm (with protective cover)) Package Size: 24 * 24 * 13cm Transmitter: 2 Mode Color: Black Features: ☀ The drone is completely protected to prevent damage to the engine. ☀ With a 2.0 megapixel HD camera, you can capture stunning images and videos from the sky. ☀ There is no need to adjust the position of the drone before the flight. ☀ With the return home button it is much easier to find your way home. ☀ With 6 rotating axles to provide greater stability to the flight and facilitate the control of the drone. ☀ With 6 channels to ascend, descend, go forward and backward, as well as side, left and right, and to make 360° turns. ☀ With built-in LED lights, ideal to give the flight a special glow in the middle of the night. Package Content: 1 x Drone 1 x 3.7V 450mAh Battery 1 x Charging Cable 4 x Propellers 1 x User Manual 1 x Driver 1 x Screwdriver Note: If you received the products whose tape has been demolished, do not worry, this is because we ship a product before doing the frequency test, in order to ensure normal customer use. If you are not satisfied with this, you can contact us to request a refund and a return.